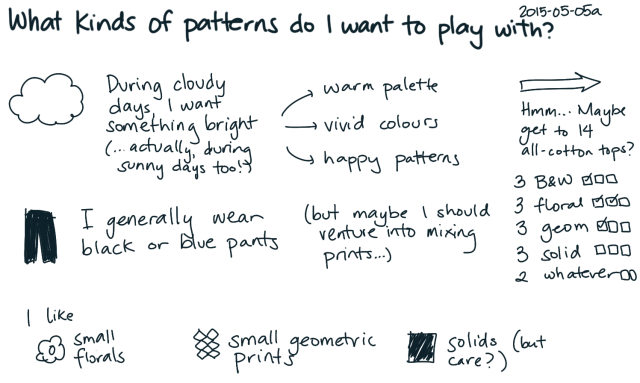 Anyway, top-wise, it might be interesting to break out of my comfort zone: not just florals, but also more black-and-white patterns and more geometric prints. 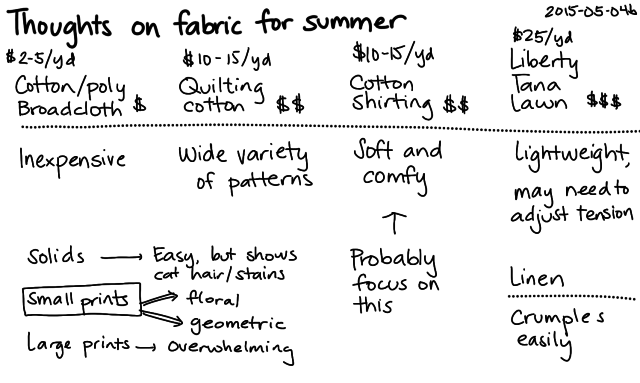 The cotton lawn feels nice, but I think the shirting cottons are okay too, and the quilting cotton is actually pretty okay once you wash the sizing out of it. I might actually have sewn enough tops now, though, especially after I finish the four I have in progress. That’s enough to spend a week in 100% cotton, which will be better than the cotton/poly broadcloth blends I started with, and maybe 2-3 weeks in between delicate laundry batches. So, time to figure out: what next? There’s a little temptation to complete things I’m tempted to try to take on more types of garments. (Get to the point, perhaps, where every stitch I wear is mine? Shoes might be tough, though. Moccasins?) 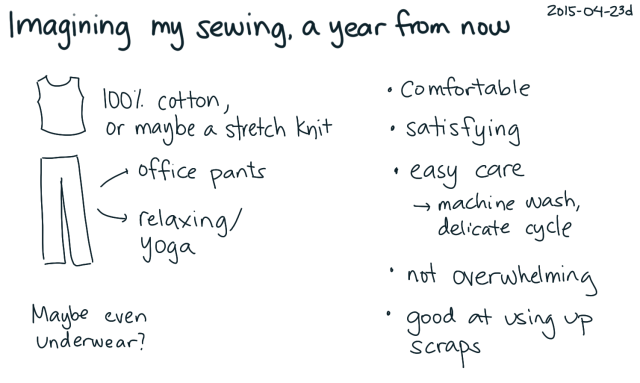 On the other hand, when I started this sewing thing again this year, I said I’d pace myself by trying to replace only one category of things per year. That way, I could reduce the risk of burnout. 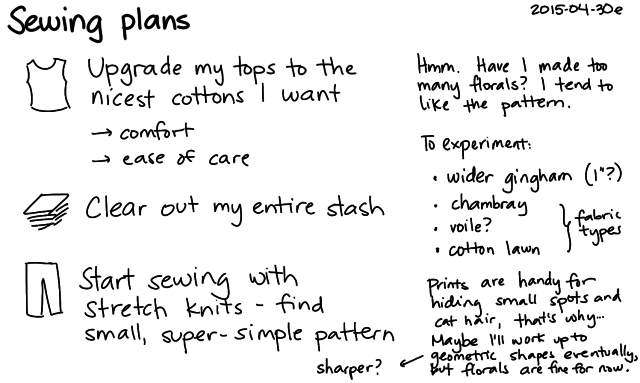 I considered upgrading the broadcloth tops to the nicest cottons I can find – probably Liberty fabric, or some of the other cotton lawns. On the other hand, that might be well in the neighbourhood of diminishing returns, so maybe it’s better to wait. I looked into sewing with stretch knits too, making a pair of leggings. I might make yoga pants at some point, but I don’t feel a pressing need for them, so I might wait too. Stash-clearing, then. 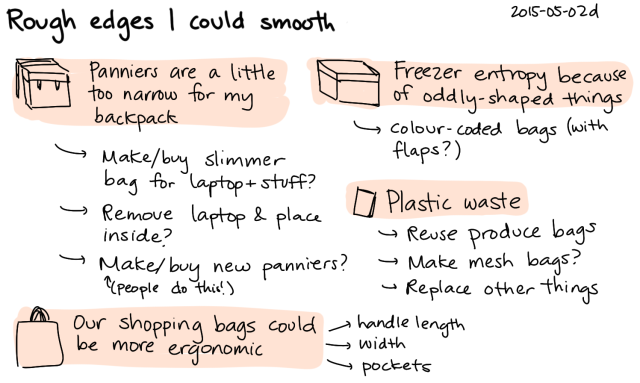 Ideally, making various containers and household things. 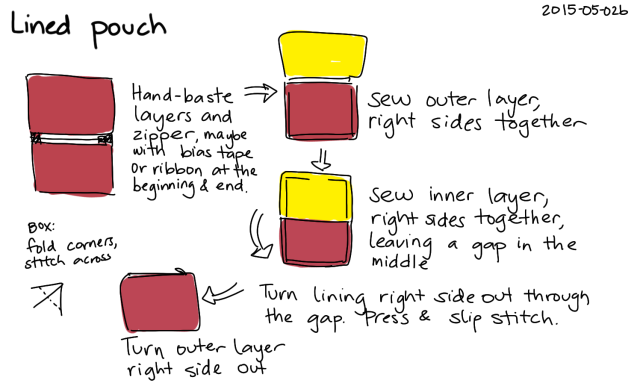 Maybe I can make a patchwork garment bag to use up some of my scraps and protect my winter coats. 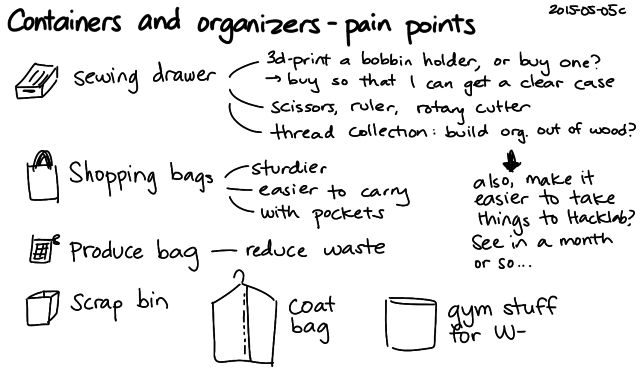 Maybe I can make bags and zippered pouches. 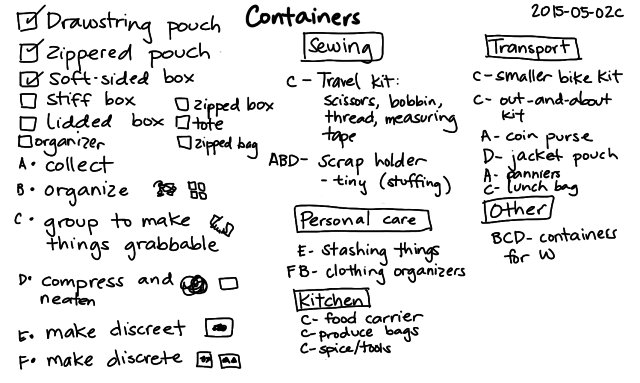 Maybe I can make things neater and more organized. I made a lined pouch with some of my scraps: the Marvel fabric on the outside, a yellow broadcloth inside, and a red zipper. It was fun. I haven’t figured out what to put into it, though. I’m sure something will come up. 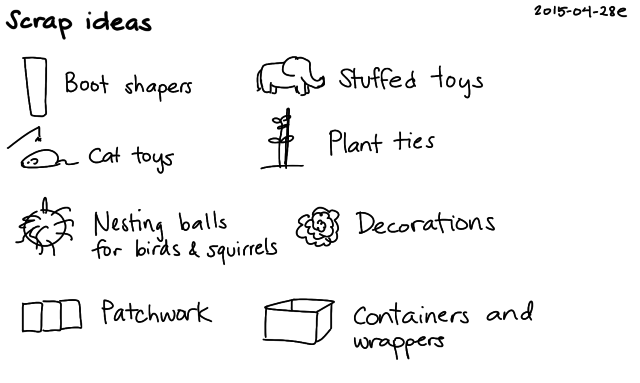 There are all sorts of containers I can learn how to make, and so many things that I can contain within them. 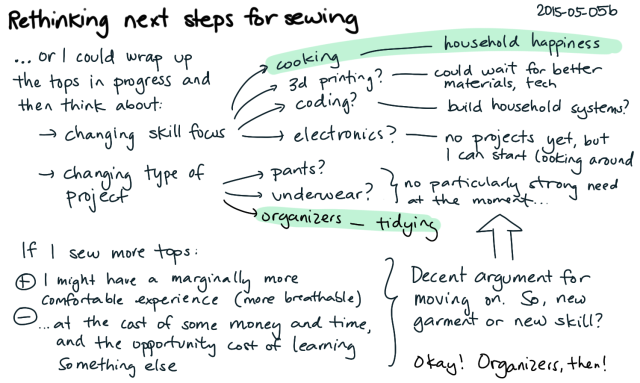 It might be good to start with the things that annoy me the most, like my disorganized sewing drawer. Mmm. Yes. Skills that improve themselves.